Last year I wrote about the origins of the native cranberry and the cultural history of the fruit in the Pine Barrens of New Jersey, as studied by Mary Hufford for the American Folklife Center. Now that I'm in West Virginia, I've been learning more about the cranberry glades here in the state-- in Monongahela National Forest and Dolly Sodds Wilderness. On New Years Eve when I was making a a lemon layer cake with cranberry curd and garnish, and my new friend Emily told me that she had harvested some cranberries in Tucker County this year, where Dolly Sodds is located. 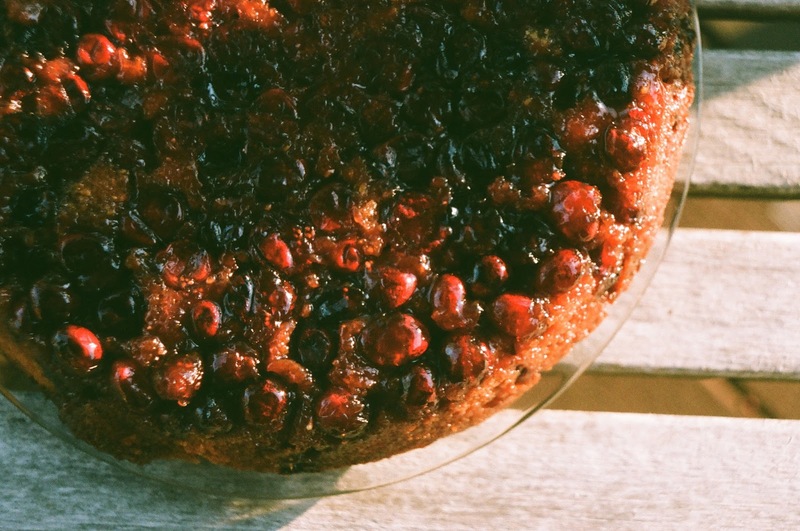 I assumed that they were the small wild cranberries I had seen up in Maine this September, but she said those she harvested were just as big as the store-bought variety I was using on the cake. I'm looking forward to being in West Virginia for cranberry season this year, but for this Cranberry Upside Down Cake, I used more of the regular store-bought variety. Cranberries are my favorite thing to bake with in the wintertime-- their tartness is a pie baker's dream and their red hue is a welcome bright spot during winter's doldrums. I highly recommend stockpiling cranberries in your freezer when you can-- they don't always stick around in grocery stores past Christmas. 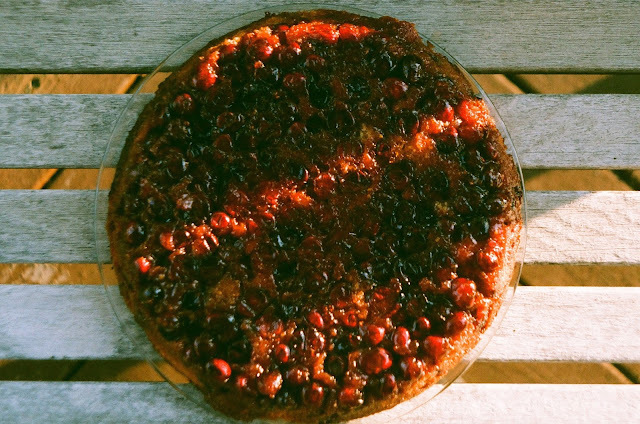 This cake, adapted from David Lebovitz, uses the pineapple upside down cake/tarte tatin principle, in which the fruit is caramelized in sugar over the stove, the batter or crust is poured over top, and the dessert is baked upside down in the same pan, then flipped so the fruit sits atop. Like ripping off a bandaid, it's best the flip is done in one swift motion and with courage. I made this for Christmas dessert this year, along with a Lemon Chess Pie and Nigel Slater's Chocolate Almond Cake. It was a big hit, especially with my dad, who I still don't think has forgiven my mom and me for leaving the leftovers at our friends' house the next day. 1. For the topping: Place the butter and brown sugar in a 9- or 10-inch skillet over low heat. Mix and melt together, stirring constantly until the sugar is liquified. When the mixture begins to bubble, remove from heat and set aside. 2. For the cake: Preheat oven to 350 degrees F. In a small bowl, whisk together the flour, cornmeal, baking powder, and salt. Set aside. 3. In the bowl of a stand mixer fitted with the beater attachment, cream the 1/2 cup of butter, granulated sugar, and citrus zest on medium-high for 3-5 minutes until very light and fluffy. Reduce the speed of the mixer to medium and add the eggs one at a time, stopping in between to scrape down the sides of the bowl. Add the vanilla extract. 4. On low-speed, add half of the flour mixture, the milk, and then the remaining flour mixture, mixing just until combined. Do not overmix. 5. Evenly distribute the cranberries in the cast-iron skillet over the brown sugar mixture (You may need to re-heat the mixture on low if it has solidified). Pour the batter over the cranberries, then use a spatula to make sure it is evenly distributed over the berries. 6. Bake the cake until the "top" is golden brown and a toothpick inserted in the center comes out clean, 50-60 minutes. Remove from oven and after 10 minutes, run a knife around the edge of the cake. Place a cake plate over the top of the skillet and flip onto the plate (have courage!) until the cake releases from the pan. Serve cake warm and enjoy. I found Michigan cranberries at the farmers' market this weekend, so I made this tonight for dinner at a friend's, and it was great. I really loved the topping and the caramelized edges in particular; the cake part was good, but not as interesting. I might try it again with sorghum or honey or maple syrup to give it a richer taste--basically I wanted that caramelized sugar all the way down.